Islam is the second largest religion in the world with over 1.5 billion followers from all over the world and rapidly fast growing religion in the world. Reports claim that from 21st century Muslims will more than the number of Christians. Pakistan is an Islamic country founded on 14 August 1947 by Quaid-e-Azam Muhammad Ali Jinnah. Pakistan was declared an officially Islamic country by PPP government in 1973 as 'Islamic Republic of Pakistan'. Pakistan is the only Muslim country who possess nuclear weapons also Pakistan has modern weapons and tanks for fighting with the enemy. Pakistan has 6th largest active military personnel in the world with 644,000 and 513,000 reserve personnel. Turkey is the second Muslims powerful country located in eastern Europe and western Asia with cultural connections to ancient Greek, Persian, Roman, Byzantine and Ottoman empires. Turkey annual defense Budget is approximately $18.2 billion (2016). Turkey has more modern weapons from Pakistan which comes from Nato and USA but Pakistan is the only Muslim state who possess nuclear weapons that's why Pakistan is more powerful then Turkey in my review,Although Turkey had signed an agreement with Nato to never make nuclear weapons. But no one can compare these two nations because both nations show their love and peace to each other. Saudi Arabia is a desert country encompassing most of the Arabian Peninsula, with Red Sea and Persian (Arabian) Gulf coastlines. Known as the birthplace of Islam, it’s home to the religion’s 2 most sacred mosques: Masjid al-Haram, in Mecca, the destination of the annual Hajj pilgrimage, and Medina’s Masjid an-Nabawi, the burial site of the prophet Muhammad. Riyadh. The Royal Saudi Arabian Armed forces defense Budget of 2017 is $69.4 Billion.Total military personnel are 478,000 and 455,000 are on reserve. Indonesia, a Southeast Asian nation made up of thousands of volcanic islands, is home to hundreds of ethnic groups speaking many different languages. It’s known for beaches, volcanoes, Komodo dragons and jungles sheltering elephants, orangutans, and tigers. On the island of Java lies Indonesia's vibrant, sprawling capital, Jakarta, and the city of Yogyakarta, known for gamelan music and traditional puppetry. Indonesian National Armed Forces defense budget of 2017 is $18.17 Billion. Active military personnel are 435,750 and 540,000 reserve personnel. Iran is an Islamic republic on the Persian (Arabian) Gulf with historical sites dating to the Persian Empire. 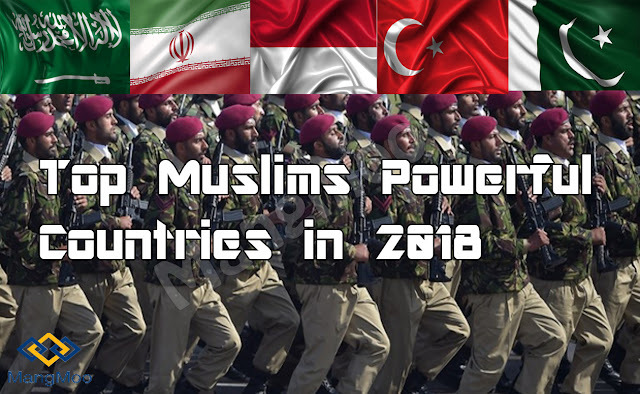 Iran is the 5th powerful country among Muslims nations with active military Personel 523,000 and 350,000 on reserve, Defence budget approximately $14.1 billion (2017). Please note that these all countries are rapidly increasing their weapons so if you will know about that change then you can leave a comment or contact us via Form.